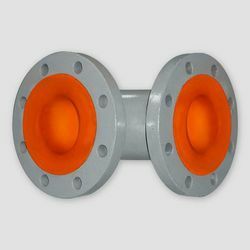 Our range of pipe fittings consists of elbows (bends), reducing flanges, reducers, tees, cross etc. 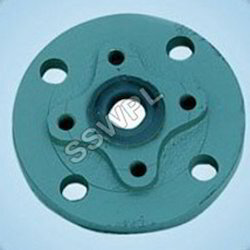 We are manufacturing and delivering best quality of Lined Reducing Flange by our expert engineers and experienced professional. These products are very highly fire resistant and our lined product is used to convey the most corrosive and toxic chemicals in manufacturing plants. These are the machines, which can be easily operated. We provide the different variety of holes and elbows. Tolerance as follows: F= 0.0/-1.0 mm. Intermediate combinations are available on special request. Size (inches) 1" to 12"
With desire to cement our reputation in the market, we are engaged in offering an excellent range of MS PTFE Lined 90 Degree Elbows. Keeping in mind current market development, these elbow fittings are manufactured by our qualified professionals employing premium quality raw material and modernize tools. Apart from this, our quality inspectors perform a series of test on the entire range ensuring its flawlessness. Since our inception, we have been instrumental in offering premium quality assortment of MS PFA Lined 90 Degree Elbows. Proposed elbow is used to change the direction of the liquid flow by a definite degree between two pipes or tubes. It is available for clients in various shape, size, quality and dimensions to meet their precise demands. 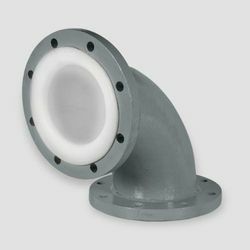 In order to manufacture this elbow as per the international standards, we use finest quality PTFE materials and pioneering techniques. Offered MS PFA Lined 90 Degree Elbows can be purchased from us at pocket-friendly price. We are offering Lined Reducer in market by our professional and experienced engineers. They are used for the various industries such as petrochemicals, pharmaceuticals and food processing. These metal tubes cannot work for a long time they are connected with concentric reducer and eccentric reducer. We serve these products in market in different type of color such as red, green, blue and pink. Clients highly appreciate our reducer for its attributes like high strength and longer working life. Our wide distribution network, has enabled us to supply this FEP Lined Reducer within the stipulated time at our clients' end. Tolerance as follows: F = 0.0/-4.0 mm. We are manufacturing and supplying an optimum quality of FEP Lined Sight Glass for our customers as per the need of them. They are lined up Double Window Type Sight Glass. These are the product which is easily maintained. Sight Flow Indicators serve quick, trustable and durable process lines of these glasses. These are well tested on different parameters to analyze the efficiency of product by our best technicians.